I was quite surprised that Mary of Keep Learning Keep Smiling invited me to do a guest post for her and I feel so honored and said “YES” immediately. I am very happy to get to know Mary through blogging. She is a very friendly lady (seems like I have known her for years), a loving mother, adoring wife and she cooks very well too. Do check out her wonderful blog. For my guest blog post, I would like to share this Tofu with Prawns – Steamed and Deep Fried. So please pay a visit at Keep Learning Keep Smiling to check my guest post. Tofu is rich in high quality protein. It is also a good source of B-vitamins and iron. Tofu is also very versatile dish and there are many different ways that it can be cooked. 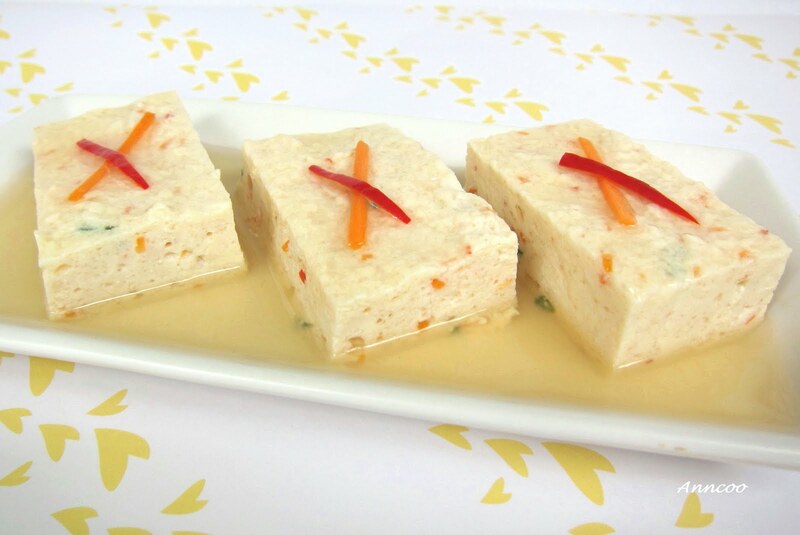 I would like to share this tofu with prawns recipe which can be served in two ways. Thank EE Tang for try this out and so glad you liked it. For the fried scallop noodles you can a little more water if you find its too dry. I tried this dish just now, I ate the steam version and it is really superb. Thanks for the reciepe. I have some left over will do the fry version tomorrow and also the fried scallop noodles. Again thanks to all for your lovely comments. Chris: Maybe I need to get the U weekly. Yin: 你太可气了。I'm also very raw when I first started this blog. But as time goes by I learned a lot from other bloggers. Some of the recipes here are from bloggers and cookbook. For photography I picked the skills from websites but still at learning stage. I love tofu… Back home, we always have some type of tofu dish. Your lovely guest post made me home sick 🙂 It's a great comforting food. the pictures look great too. This tofu looks great and I would prefer it fried. I visit Mary's blog often and it is great; glad your posting there! Beautiful. 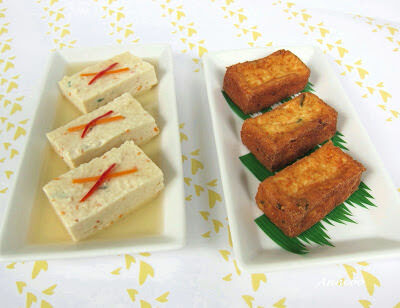 I love tofu, and both versions look delicious! Peachkins, Natasha, Wenn: Thank you for your lovely words. Blessed Homemaker: Thank you very much for your compliment. Yes the steamed one is more healthy for kids. HS: Thank you for your nice comment. You can serve the steamed one first and keep the balance for next day and deep fry it. HH, Gera: I totally agree. Most of us like the the deep fried one. Wiffy: Thank you very much for reading this post at Mary's site. Thanks Sook! Mary will be most happy to see your visit. Christine: Yes, please try this recipe. Really hope you like it. Blackswan: Thank you so much for visiting and your nice words. Bee Bee: Yes I love the deep fried too especially dip in chilli sauce. Angie: Thanks! Most of us like the deep fried one. Thank you Lyndsey! I love the way you pan fry the tofu too. Thanks Katy! Hope you can try some. Thank you very much Petite for your compliment! Divina: Thank you for your compliment. I love to read your blog very much. Lia: Thank you 🙂 I also hope to see more of your cooking too. Chris: Yes I also like to try this tofumisu. will check whether can get this recipe. Sugar Plum Fairy: Thank you very much for your compliment. Murasaki: Really? Maybe can make your own tofu. Anyway I love Japanese tofu. Taste Hongkong, Penny: Thank you! Hi All, Sorry that I did not response to your all your comments early due to internet connection was down just after I uploaded this post. I'm really happy now that after two days everything is back to normal. I don't quite like plain tofu but made this way, ANYTIME! I love the fried version. Dip in chili sauce, yum yum! Well done, Anncoo. I keep thinking that I do not like tofu and that there is no way on heaven and earth that anyone could convince me to eat it, but I see this, and I think….I am so wrong. I would like to sample this! 厉害, 做的好像餐馆卖的那样!我爱吃豆腐和豆花的程度为我赢了两个封号 – 豆腐姑娘, 豆花嫂!! 呵呵呵呵..
Beautiful photos, it make them look mouthwatering! Yum! Tofu is my favourite too!! I love both.. haha.. I want to have some too! Esp. that fried one! The prawns must have added so much flavor to the tofu. I love them both ways. I love the fried one…can imagine the crispy outside and soft creamy inside…yum! So mouth watering! excellent picture. Dropping by from Mary Moh…. This is an awesome recipe. Love your pictures too! Seriously, I always thinking of cooking tofu and prawn. And this dish is a must to keep. I saw this post at Mary's! Wow, what a beautiful dish! Love it. OMG! 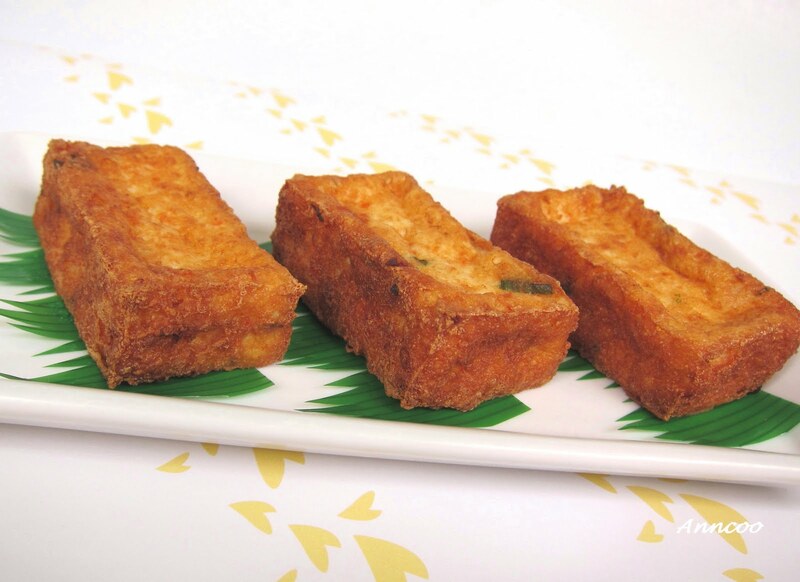 This tofu looks outstanding… my preferred is the golden, crispy one! Gosh, I like both of them! Looks yummy! I opt for the deep-fried version over the steamed ones. But if I were to cook this, I'll definitely steam it for my kids! Hahaha! You are such a great cook and baker! Kudos! Thanks for sharing such nice recipe, the fantastic part is can steam and deep fry so this will help me to suite all my family members. Wonderful! I love seeing the two delicious preparations side by side! Great dish to guest post! A hearty guest post, Ann : ). The Tofu here is really disgusting. When I look at this, it really makes me wish I could find something better! I so muc agree, Anncoo is absolutely creative and talented . So presentable! And yet two flavours at a time. Great great job! Enjoy! Will hop over to the other side. I like this too. Did you watch last night's programme? Tofumisu – very interesting! Yummy … you are indeed very talented in cooking. So great to see you make two version for the tofu. Both of them are just perfect!